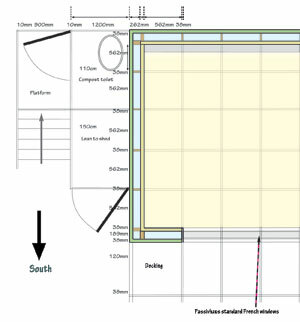 This plan for a sustainable building is modular in the sense that the plan area can be any multiple of the distance between wall studs in depth or width, to create buildings that are larger. Structurally, it can take at least two storeys. The building sits on railway sleepers resting on old tyres filled with hemcrete (could be rammed earth or concrete), with no need for foundations. It is timber frame, insulated with wood fibre and recycled newsprint (cellulose) insulation (the cheapest), fitted with South-facing, triple-glazed Passivhaus-certified windows to capture the solar heat, lime-rendered, and fully breathable. This makes the building at least zero carbon, since atmospheric carbon is locked up in its structure and it needs virtually no energy input for heating or cooling. In fact the energy used is renewable, so this building generates ‘negawatts’. The floor has black ceramic tiles to absorb solar heat. The roof slopes slightly backwards from the front and has a green roof planted with sedums which attract bees and butterflies. There is guttering at the back. The insulated floor (woodfibre batts and Warmcel) and interlocking cladding on the outside, sitting on the tyres, before rendering. The heating is electric, underfloor, which is more efficient, but is hardly needed.This was chosen because the supplementary heating requirements are minimal; it is efficient; the building runs on renewable electricity; and not having a woodstove avoids puncturing the thermal envelope to make a hole in the ceiling (it would also require ventilation to supply fresh oxygen to replace that being burnt!). Thermal bridging is completely eliminated chiefly by cladding all the way round with tongue and groove wax-impregnated (for waterproofing) woodfibre boards, finished with lime render, itself having a slight insulating property. The building can be, and was, constructed by a conventional builder who is well supervised. Contact us if you wish to consider a building like this.